Executive compensation wasn’t always so outlandish (and still isn’t in most other developed countries). In 1980, U.S. CEOs out-earned the average worker by a factor of 42. The gap peaked at a ratio of 525-to-1 in 2000. The average Japanese CEO in 2012 made 67 times what the average Japanese worker earned. French CEOs make 104 times the average French worker's pay. Spain's CEOs out-earn the average worker in their country by a factor of 127. In 2012, the average German CEO made 147 times what the average worker earned. The average UK CEO earned 84 times what the average worker made in 2012. The Swiss are voting in Nov 2013 on whether to cap CEOs’ pay 12 times what their lowest employees make. On November 24, 2013, voters in Switzerland – usually a bastion of big business and capitalism – will vote on an initiative designed to cap the salaries of CEOs of Swiss companies to 12 times what their lowest paid employees make. 3. Put another way, the average U.S. CEO took home about $5,894 in pay for every hour of work last year (based on 52 40-hour weeks). 4. By comparison, the average U.S. worker pocketed $16.66 an hour — while a worker at minimum wage earned $7.25. 6. Germany’s CEOs received an average compensation package of $5.9 million in 2012. That was the third-highest among OECD countries, following the United States and Switzerland, where CEOs earn 148 times the average worker pay. 7. By comparison, the average German worker was paid $40,223 last year. The country’s CEOs therefore out earn the average worker by a multiple of 147. 8. Among Europe’s other large economies, French CEOs earn 104 times the average French worker’s pay, while Spain’s CEOs out-earn the average worker in their country by a factor of 127. 12. In 1980, U.S. CEOs out-earned the average worker by a factor of just 42. The gap peaked at a ratio of 525-to-1 in 2000. 13. 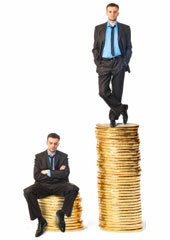 The average CEO of a large Japanese company earned almost $2.4 million in total compensation in 2012. 14. That is 67 times what the average Japanese worker earns. 15. When it comes to the average compensation for rank-and-file workers, wages in both countries are roughly the same ($35,143 in Japan, compared to $34,645 in the United States). From Executive Paywatch: CEO Pay and You by the AFL-CIO. Data on international ratios are from the OECD.